Eating more vegetables and cutting out the meat from some meals is a great way to cut back, eat on a lower budget and increase your intake of vitamins and other good things all in one go! As is customary in January, I am trying to eat lighter meals at the moment, and this dish is one I recently developed for the slow cooker. Packed with roasted vegetables cooked with only a tiny bit of oil, this roasted aubergine, courgette and pepper bake is full of goodness and flavours. I don’t know about you but I find it hard to eat cold food like salads in the winter, preferring a warming bowl of soup or stew. So a hot vegetable dish is perfect, especially served with crusty bread or a wholemeal roll on the side. 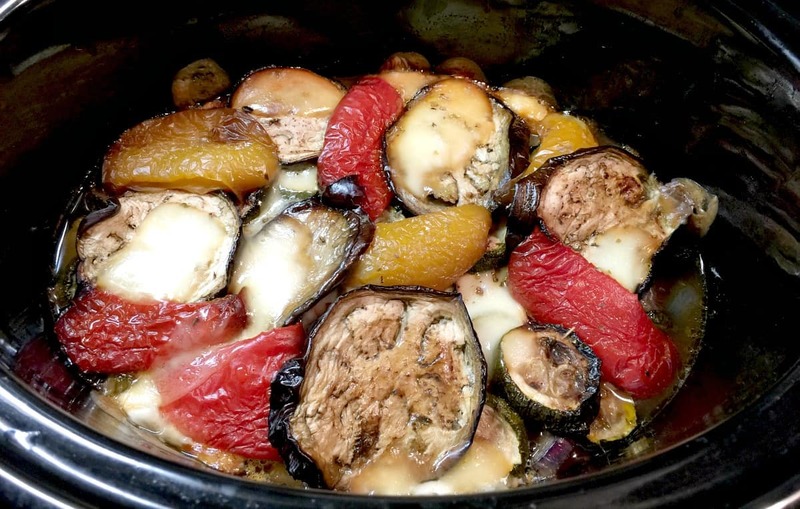 My slow cooker aubergine, pepper and mozzarella bake was great on a wintry day. The roasted vegetables are layered up with an onion, garlic and tomato sauce, with mozzarella pearls on top of each layer. There is just enough mozzarella without it being excessively cheesy – however if you aren’t watching the calories feel free to throw some more in! 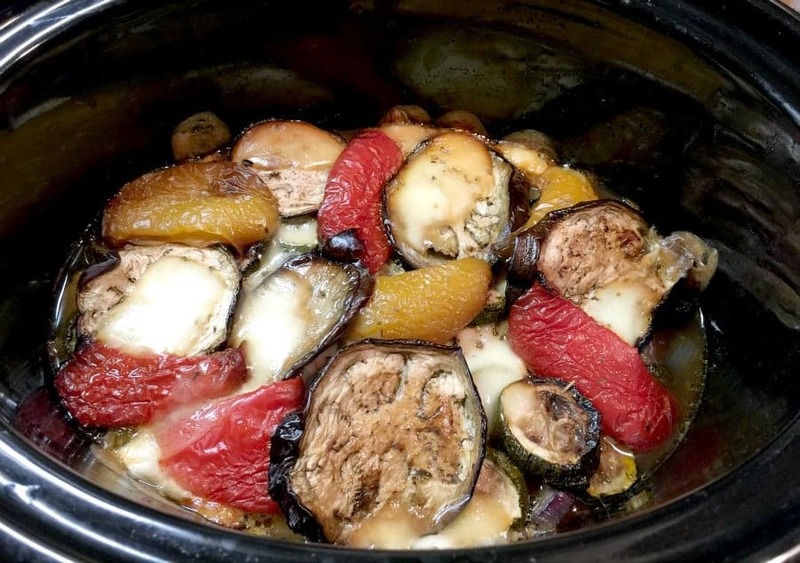 How to make a vegetable bake in the slow cooker? 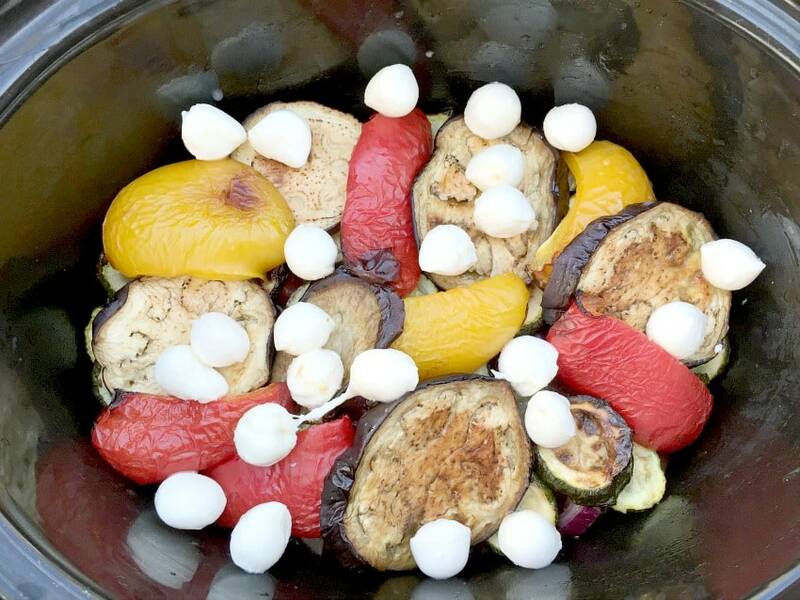 Layer up the roasted vegetables in the slow cooker. Add mozzarella balls and then add the second layer. Cook! On serving, you’ll have a vegetable bake with tasty roast vegetables covered in cheese, so good! Look out for more vegetarian recipes from me soon, I’m finding it a great way to cut the calories and save some pennies. 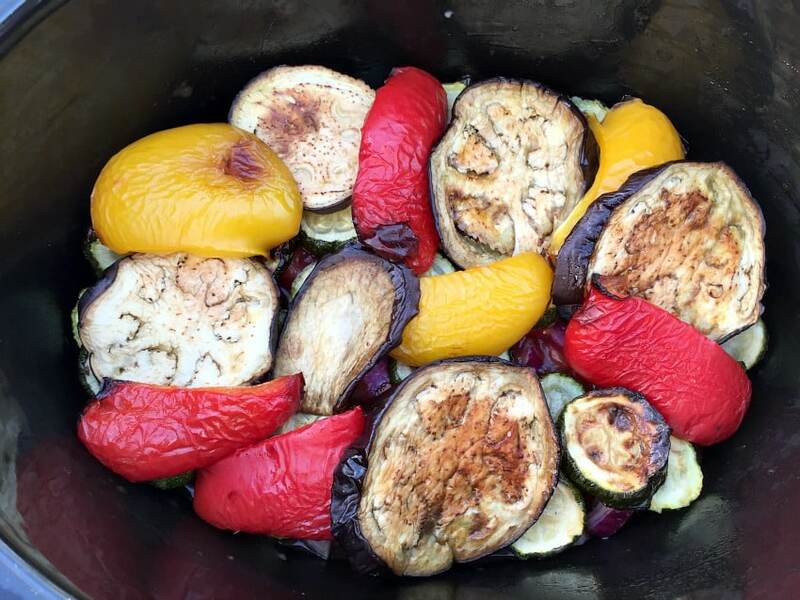 First roast your sliced aubergine, peppers and courgettes for 25 minutes in a little oil. Allow to cool. Next, oil your slow cooker pot lightly to stop the cheese sticking. In a bowl mix the red onion, garlic, tin of tomatoes, salt and pepper and oregano to make the tomato sauce. Place half of the sauce in the base of the slow cooker pot. 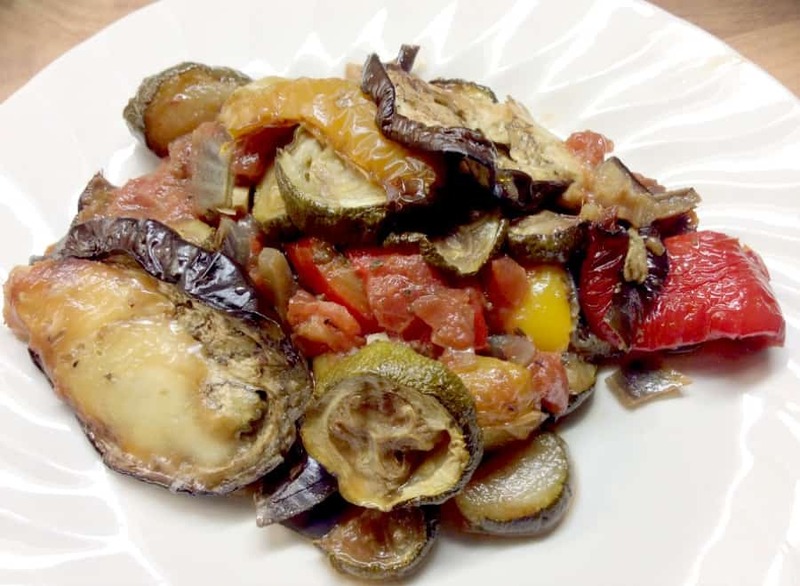 Top with slices of aubergine, peppers and courgette. Add half of the mozzarella pearls on top. Do another layer - the rest of the tomato sauce, a layer of courgette slices, with the rest of the aubergine and pepper slices on top. Add the rest of the mozzarella pearls and a sprinkle a little oregano on top. Cook on low for four to six hours. 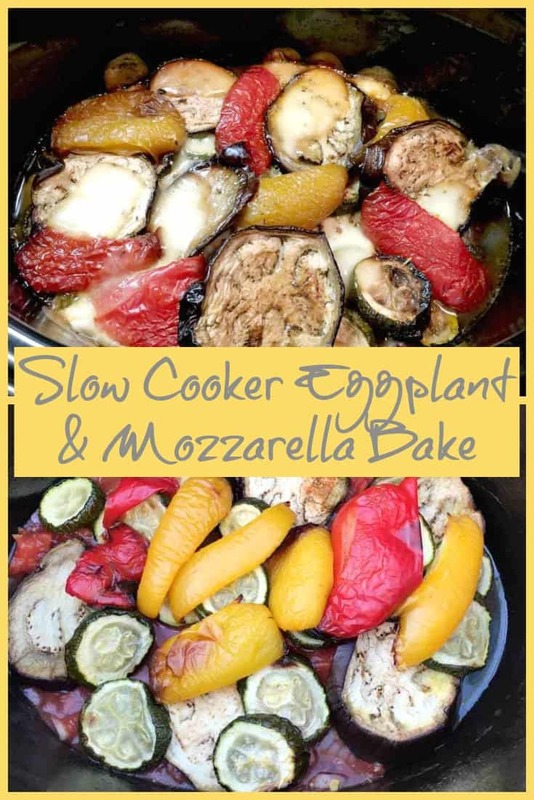 Great use of the slow cooker Lucy, and also it is nice to see a slow cooked veggie dish, I find when I cook aubergines they soak up oil like a sponge, and this is lovely and healthy. I must try this as it look soo good! My daughter loves ratatouille so I know she would go crazy for this! 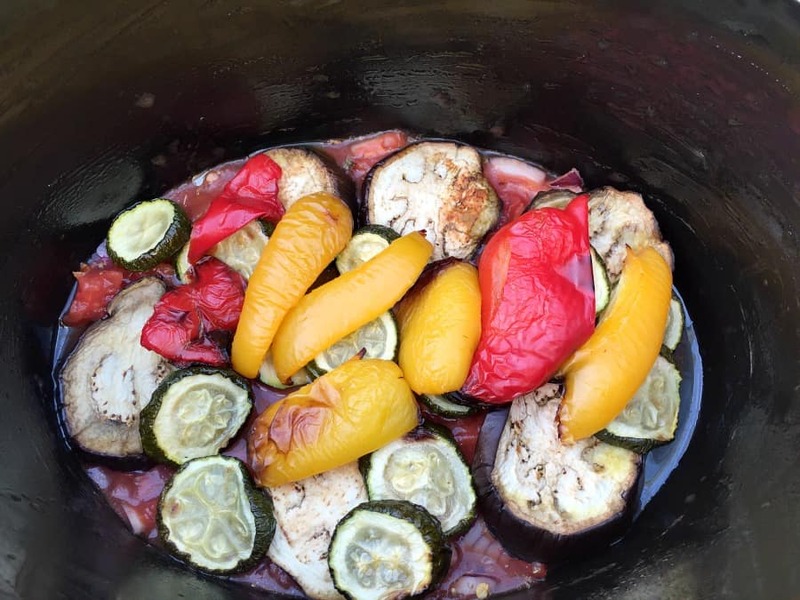 I wanted to show that a slow cooker isn’t just for meaty dishes, this worked really well. Glad it made you hungry too! I love slow cooking, I need to do it more so will have to try this recipe! Glad to hear you like it Monika, do let me know if you do try it!